WELCOME HOME MATER DEI HIGH SCHOOL ALUMNI! The MD Office of Alumni Relations is committed to serving our 25,000 plus Mater Dei graduates. 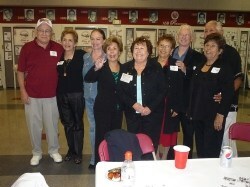 provide business networking opportunities and to organize class reunions every 5 years. Signing up for the NEW Scarlet & Gray Monthly E-Newsletter - CLICK HERE! Thank you and we look forward to seeing you at an MD Alumni Event soon.